write the wrong number of words on your answer sheet. make spelling or grammar mistakes on your answer sheet. forget to transfer your answers to your answer sheet. You need to choose a word or words provided in a box to complete the gaps (as in Ex. 1 b in Skills Focus). There are always more words provided than you need, and they will not all be correct for each gap, so you will need to choose the correct one. You need to read the instructions carefully to see how many words you need to write: one word only, no more than two, or three, four, etc. Remember to copy words from the text exactly. You will lose marks for spelling or grammar mistakes. It is useful to write your answers in the summary initially, as this can help you understand how the text develops. But after, you must transfer your answers to your answer sheet. Remember you are not given extra time to do this. The examiners only mark your answer sheet, not your question paper. You may find this task in Section 1, 2 or 3 of the Reading Paper It often tests factual information in descriptive texts. You will need to scan the text to find the information. Use key words to help you find the information, and remember you may need to look for paraphrases of words. Practise finding key words and making paraphrases. try to identify key words in what you read – in advertisements, leaflets, brochures, newspapers, information leaflets etc. practise paraphrasing i.e. think how you could say the same thing in different ways. This might be individual words, phrases, sentences or paragraphs. Find out about them by, for example, doing an Internet search for ‘what is a flow chart’ ? This will help you understand their purpose and the different forms they can take. Read longer texts from newspapers, magazines, books or online to prepare yourself for Section 3. Your CV is possibly your most important tool in your search to find the right job. It is the first thing a future employer sees about you, and if it’s not right may be the last An employer will do no more than glance at your CV – it’s estimated that most employers spend no more than twenty seconds looking at each CV, so you have very little time to make the right impression. Here’s some advice to help you make the most of those twenty seconds. The first rule of all CVs is keep them clear and simple – anything complicated or long tends to get rejected instantly. Achieving that is a matter of making good use of lists, bullet points and note form, and of keeping your CV to the right length. There are no fixed rules on how long it should be, and it will vary, of course, according to your age, experience, etc., but keep it to one page if you can – this length is convenient for your reader to work with. As for style, there are different kinds of layouts you can follow – look at the examples on this site to see which one you prefer but the basic rule is to use headings well to signal clearly where all the relevant information is. Make sure you include these sections: qualifications, skis, education, work experience, references, personal interests/hobbies, personal qualities, then label them clearly so that your prospective employer can find the information they want quickly and easily. CVs tend to follow a fixed order. They start with your personal details such as name, address and contact details, then go on to personal qualities such as those things in your personality that might attract an employer e.g. conscientious, adventurous, punctual, etc., and your career goals. After this comes the main part of your CV starting with education, then work experience. Use reverse chronological order to list these, starting with what you’re doing now. It’s most common to go back no more than 10 years. Give your job details such as job titles, the names of the organisations you worked for, an outline of your job duties and then note your particular achievements. not follow up on these, but they do make an impression. A glance at your CV should create a good impression. Don’t make spelling mistakes, and don’t send in anything crumpled or with coffee stains on it Anything like that leads to instant rejection. Use good quality A4 paper and don’t send in anything other than a cover letter. Diplomas, testimonials, etc.. will be requested later if they’re interested in you. When you think you’ve finished writing your CV, read it over very carefully. Check your full stops, use of bullets ,indentation, use of capital letters, etc. And never include in your CV anything that’s not true. It’s very easy for an employer to check, and if your CV doesn’t match what they find out then your chances of getting that job are probably gone. Finally, carry out the instructions in the job ad very carefully. If they require three copies, then send them three copies, not two or four. Make sure you meet the deadline too, and put the right stamp on your envelope. You’ll need to accompany your CV with a cover letter. This should be tailored to each job you apply for. Follow the link below for advice on how to write a cover letter. And last of all “ Good Luck”! Do the following statements agree with the information in the text? 1 CVs are essential when applying for jobs. 2 Employers spend a long time reading applicants’ CVs. Choose NO MORE THAN TWO WORDS AND/OR A NUMBER from the text for each answer. Write your answers in boxes 4-7 on your answer sheet. Complete the summary in the box with words (A – K) below. Write the correct letters for your answers in boxes 8 – 13 on your answer sheet. Can I have some download links for IELTS General Training Reading with answers? Hi, please check your email for all materials for IELTS General Training Module. May I ask for general test material as well, please? please if you can send me link to download for practice test for general reading . 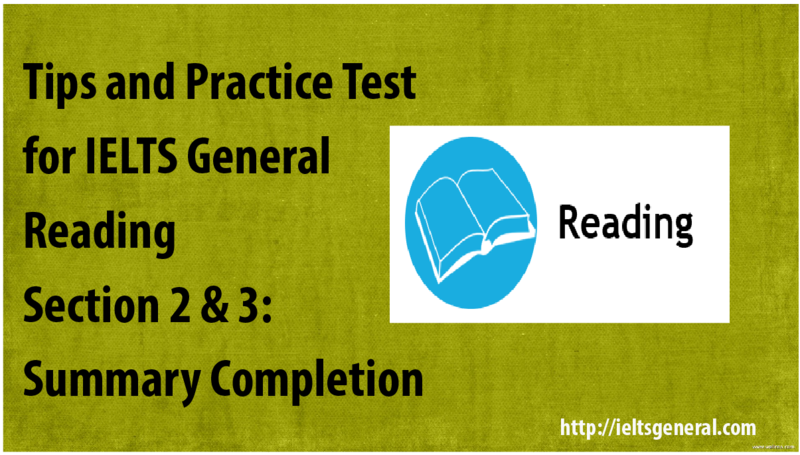 Where to find answers for General Reading Practice tests. They are very use full for me to begin learning IELTS. A wonderful initiative team. Thanks for sharing the knowledge. Can you please share the answers to this reading test as well.